Come to the side of our house, and you will be greeted by a lovely planter of flowers, but if you look closely you may see a little more. You may see the fairy house and pond and if you are really lucky you may see our little fairy, Elizabeth, (Hazel is naming just about everyone Elizabeth these days) dipping her feet in the pond to cool off or tending to her garden. 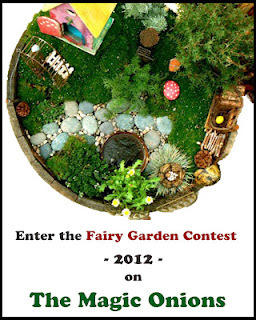 Last Friday I posted about The Magic Onions Fairy Garden Contest. Over the weekend, Hazel and I planted and started working on her garden. I love this idea of bringing some of the fantasy world to live. It gets her planning and thinking even more than she already is with her imagination. First, we went to the store to pick out some flowers for the garden. She wanted a red geranium, some orange marigolds and various pink and purple petunias. We also bought a large pot to plant them in and start our fairy garden. 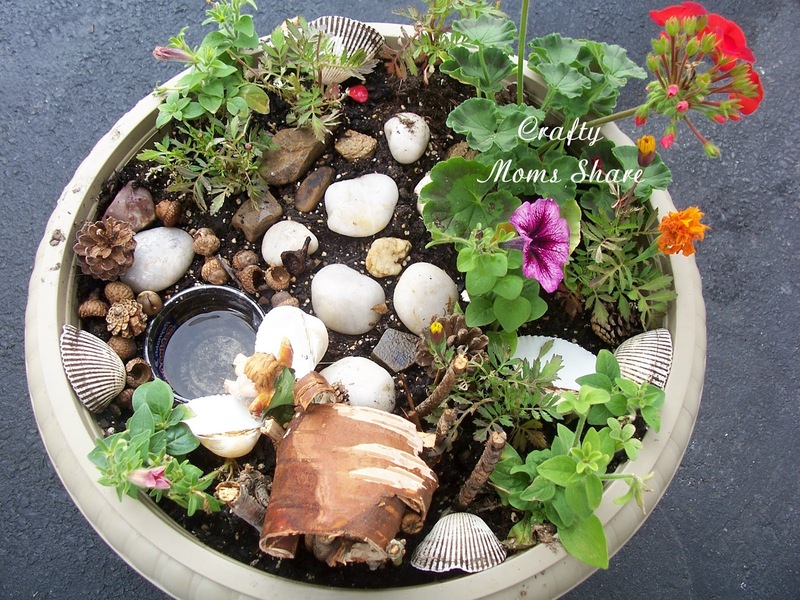 We filled the pot with dirt. 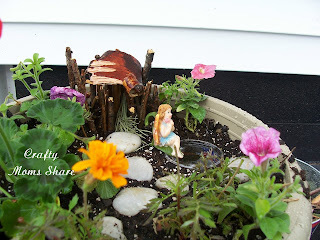 and then found some sticks to make a fairy house and we used a piece of bark for the roof. 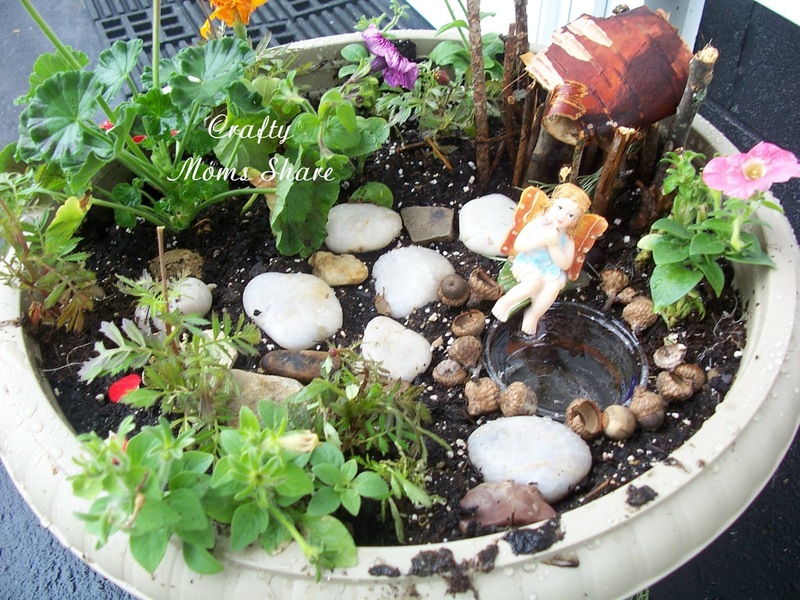 We also used an old cupcake liner container to be a pond by the house. then we planted the flowers where Hazel wanted. 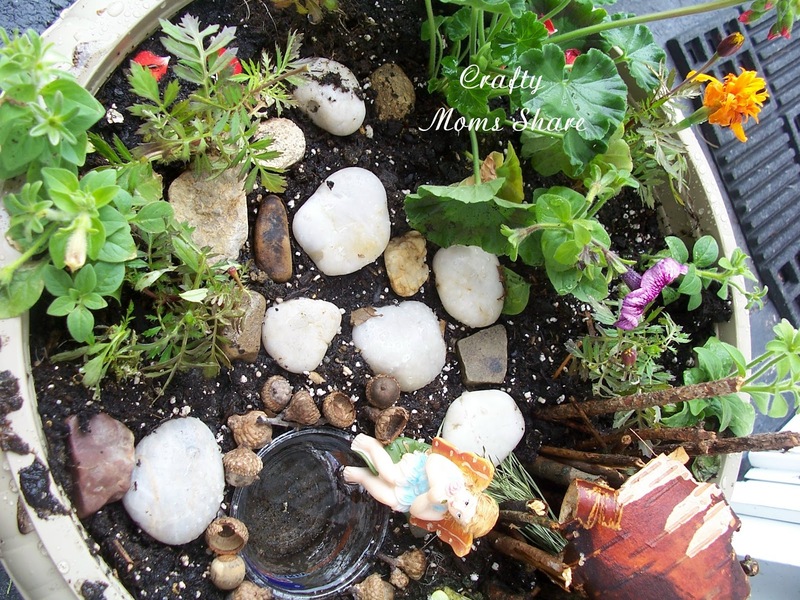 Then she added some rocks to be a path. We also added a small fairy that is meant to decorate a flower pot (she has a hook to hang from the edge on her back). Hazel decided it needed some acorns and pine cones. We put the acorns around the pond. At this point Hazel got distracted and didn't really finish. She talked about pine cones and shells. So we waited a few days and finally added them. 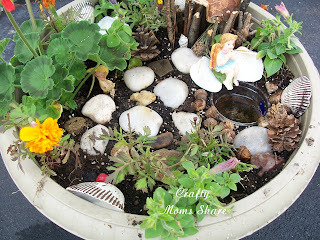 We decorated with the shells and pine cones and we also used some shells as seats by the pond and in the flowers. Now we will share at The Magic Onions to enter the contest. I hope you will join us in entering. All of us would like to be able to give thanks sharing your details. publish thank you so much again. These are so much fun! 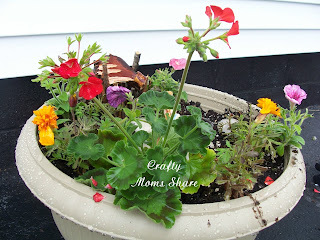 We just went to the nursery this week and bought a few things to start our own mini garden. Yours turned out wonderful! I love the little fairy paddling her feet in the water. So cute! Elizabeth is adorable. ;) Love the design, very cute. How precious! Elizabeth and her soaking feet are adorable!